Roll over the stars for an explanation. The Intellinote Bill Counter is easy enough for anyone to use. Even if you aren't the most gadget oriented individual you can quickly learn the functions of this compact unit. To begin plug the counter in and flip on the red power switch located at the back of the unit. Once power is established the machine automatically self-diagnoses. If there is an error within the system, it will sound an alarm. In the unlikely event this occurs we have an easy to follow trouble shooting guide. If you'd like to BATCH count start by pressing "preset" key to switch on the batch counting mode. The batch number will increase by an increment of 5 pieces, when you reach the number you are seeking enter the bills into the hopper to begin the feed. Select RESET to clear the menu. 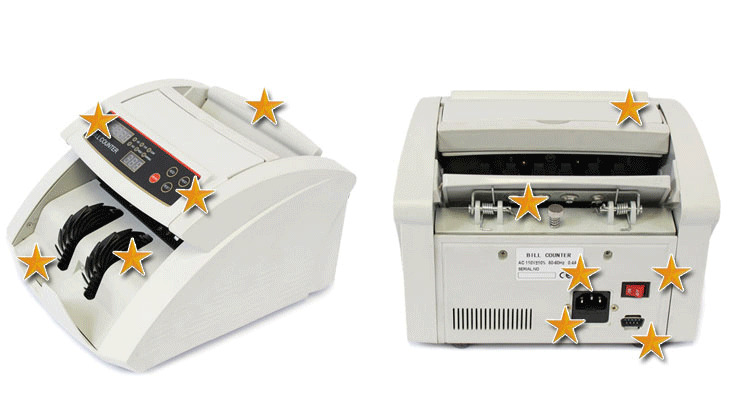 With the counting speed of an amazing 900 bills per minute ¨C you'll never go back to counting by hand again!